Setting up files is easier with our easy-to-use layout templates. 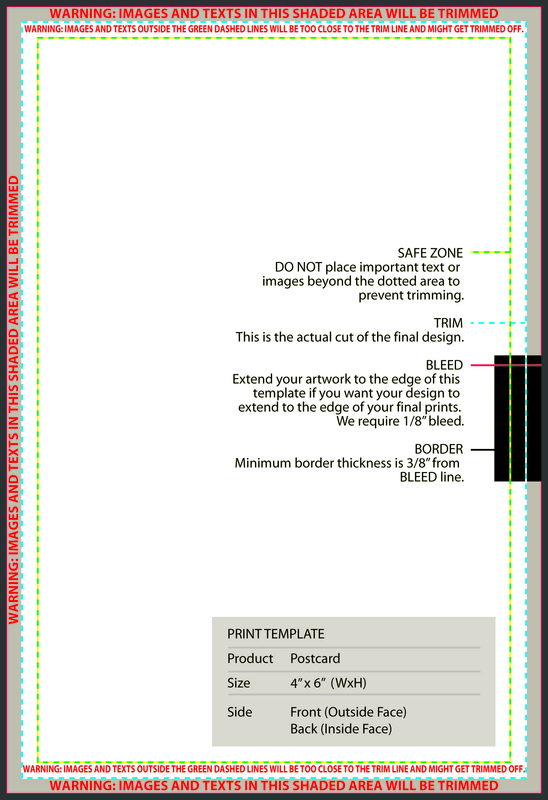 These templates are available for the majority of our printing. There are different ways to download our templates. We have dedicated pages for both standard, folded, die-cut, specialty, and large format product templates. The templates can also be accessed through a specific product page. Let’s use direct mail postcards as an example. Once you’re on our Direct Mail Postcards page (or any of our product pages), simply scroll down the page until you see three tabs: Product Specs, Reviews, and Templates. By clicking on templates, you’ll get access to all the available templates for that product. We offer templates in different sizes and formats. You can download templates in the following formats: Adobe Illustrator (AI), JPG, PDF, Adobe Photoshop (PSD), and Publisher (PUB). Clicking on any of the icons will start the download. Once downloaded, unzip the file and there you’ll find your template. Each template indicates issues you should look out for. Basically, you want all the important elements of your design to be within the safe zone or the area that would be left untrimmed after we’re done with cutting. Our file preparation guide walks you through the steps you need to take before you submit your file for printing. Still, if you’re worried that you set up your file wrong. There’s no need to be. All files are reviewed for technical errors before they’re submitted for printing. You can even use our FREE proofing to see your proof for yourself before you buy anything.